Right, again with the cleaning / moving of the sewing room. This is going to be an all summer project I think. At any rate, I went at it hard today looking for my missing three Burda World of Fashions (1/08 — on loan, 2/08 — still missing, and 5/07 — on loan). In addition to my pink Dritz C-Thru ruler. Lo and behold, what did I find? 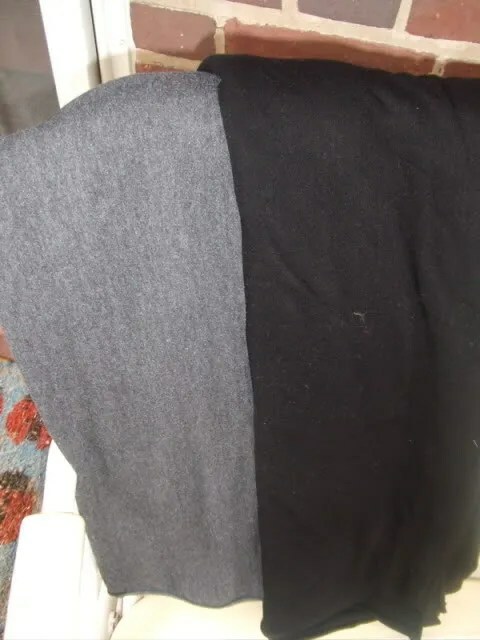 The rayon knit from Philadelphia!! It’s been missing about eight months now and it turned up crammed on a shelf. 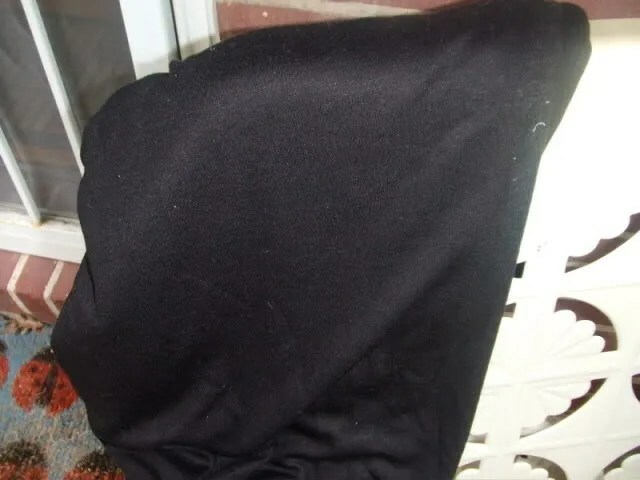 It’s a good thing I broke down and bought more black knit last week thinking this one was lost for all time. I also started pulling out my traditional sewing patterns. I didn’t think I had that many as I had done a big (not thought out) purge five years ago. Hummm. Ok. So, these will get the color scan at work during the next few weeks, burned on a CD and stored on Flickr. And, anyone want some patterns? Here we have two vintage robes / smoking jackets. I think they have both been cut into. 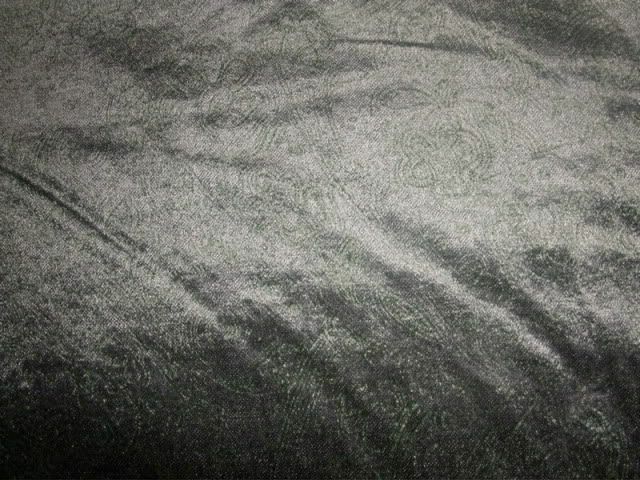 The velvet and pattern can be yours for the cost of a flat rate box to wherever you are. International included. Just email me at miss celies pants at gmail dot com. Ooo…that velvet is gorgeous! I can definitely understand about the intense process of moving a sewing room. Mine is much less extensive than yours, and it seemed to take forever when I moved it into the basement last year. I hope it goes fairly smoothly for you! If you have no takers for the fabric and patterns, I’ll take them off your hands! I have the perfect coat in mind for the fabric and I have four metres of terry towelling that has been wanting to become a robe for a long time. 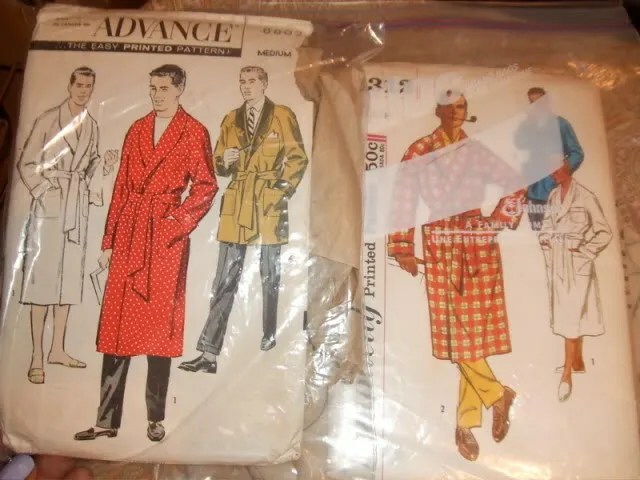 I’ll take the men’s trench coat pattern if it’s still available. (sorry, I have no need for the other patterns or fabric – I feel a little pattern and fabric purge coming on myself!). If one of the robe patterns is available, I will most certainly take one. Hubby’s RTW robe is scratchy, so he needs one of fleece. While I do have a contemporary pattern, I really prefer vintage. Thanks. I think you’ll be so happy after the clean up. My sewing room is small and I haven’t had it that long, but that hasn’t stopped me from overfilling and cluttering it up in a big way. I admit I’m a slob! But it finally hit me that what little sewing I’ve done lately has been downstairs in my living room on my portable machine, just so I wouldn’t have to deal with my sewing room. Crazy. Anyway, I tackled some of it over the long weekend and the effect was immediate: I got halfway through the Jalie stretch jeans pattern which I’ve had for well over a month. The partial de-cluttering has made a huge difference–I actually want to sew more and I’m getting more done. Any chance you’d share your BWOF filing strategy? 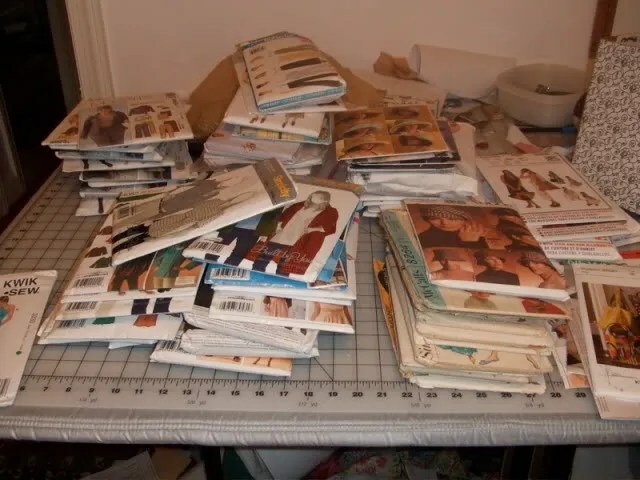 Brava on cleaning the sewing room and de-stashing patterns and fabric you’ve lost interest in! I wish I could do it, but you’re much more courageous than I am. 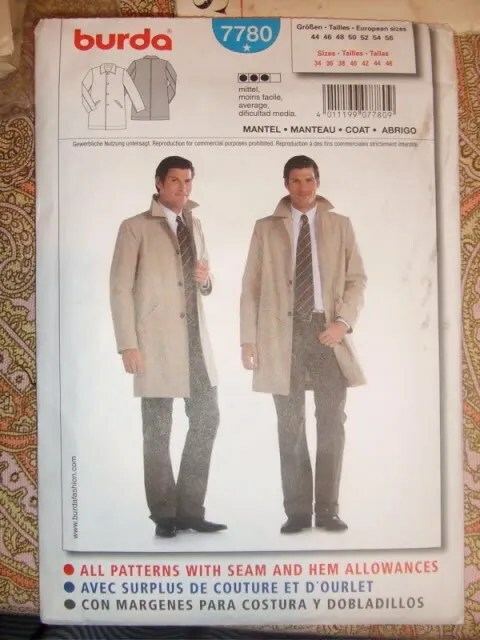 By the way, I have a Burberry trenchcoat and this pattern is nothing like it. It’s more of a balmacaan, actually.